Adam Levine of Maroon 5 performs at the Rock in Rio music festival in Rio de Janeiro, Brazil, Sept. 16, 2017. Big Boi and Travis Scott will join Maroon 5 in this years Super Bowl halftime show. 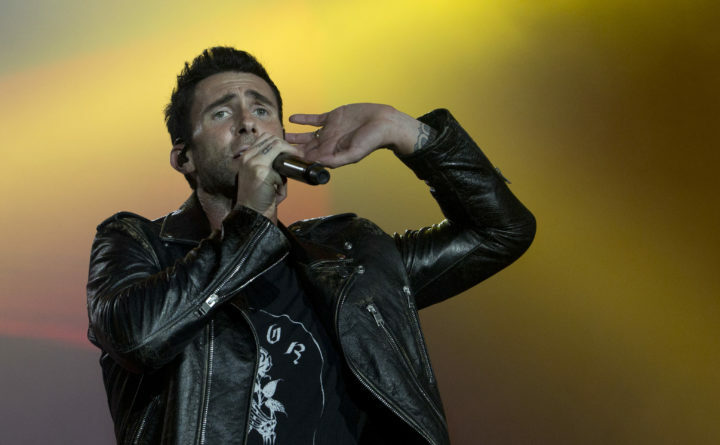 Maroon 5 had been the widely reported halftime show act since September, but the NFL officially announced the band as its headliner Sunday. The NFL officially announced Sunday — finally — that Maroon 5, backed by Travis Scott and Big Boi, will perform during this year’s Super Bowl halftime show in Atlanta. It’s an unusually late move for the organization, which typically has the musical act lined up for months, to make an official announcement during the second week of the playoffs — less than a month before the big game. The Super Bowl tends to draw the biggest (and least controversial) names in pop, so enlisting Maroon 5, which has earned 14 top 10 hits on the Billboard 100 and sold more than 50 million albums, makes sense for the most-watched show of the year. Six-time Grammy nominee Travis Scott and six-time Grammy winner Big Boi, the latter of whom calls Atlanta home, will add a hip-hop tinge to Maroon 5’s inoffensive pop. This year’s booking was fraught with controversy. Unofficial news of Maroon 5’s headlining broke in Variety in September and was quickly met with a disappointed sigh by many fans hoping the NFL would tap into Atlanta’s deep bench of talent. Meanwhile, questions of who might join — or replace — the band quickly flared up, with Travis Scott’s name a front-runner in the conversation. Artists including Rihanna, Adele, Jay-Z, Pink and Cardi B all reportedly turned down the spot, citing the Kaepernick situation. The Super Bowl will be broadcast from Mercedes-Benz Stadium in Atlanta on Feb. 3.